Reaction vs Response. What is the difference? We have the power to choose the way we deal with different anger provoking situations. The choice is between reacting and responding. How different are these terms? React - It is defined as an act in response to something.to behave or change in a particular way when something happens, is said, etc. For instance:You hit me; so I’m going to hit you. You cheated; so I’ll cheat too. You annoyed me, so I’ll get my revenge. You yelled at me, so I will yell back. 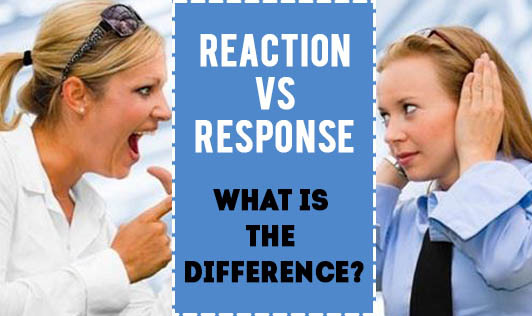 Respond - It can be defined as saying something in reply. Response is more thoughtful and done with reasoning. People who respond put their thoughts ahead of their actions. They think and formulate an intelligent and suitable reply before going vocal. Consider this example. Imagine yourself going to a crowded place such as a concert, sporting event, bar, or night club. As you enter you bump into someone and before you can say sorry, the person pushes you. Why do you think the person did this? Perhaps he/she may have thought that you bumped on purpose and wanted to pick a fight. The push they gave you in return is a reaction. It was like reflex, where they did not pause to reason. It was just spontaneous and thoughtless.